2017/18 has been an excellent year for the parish council. As in previous years we have continued to put in place procedures and processes to make the council more transparent in its dealings and bring about more participation from parishioners. We’ve had a full membership of nine councillors, most of whom have completed training to improve decisions in relation to planning applications. However, Jane Davies has recently resigned due to changes in her working hours. She has served the community well over the past few years; especially looking after the interests of residents at the western end of the Roman Road we thank her for her service and wish her well. There has been a great deal of housing development within the parish over the past year; the Bloor development along the Western side of the Roman Road is in full swing. We have been monitoring progress and engaging with parishioners, who have concerns about the development. Over the years the parish has been unable to exert any meaningful influence over planning, however, now we have our Neighbourhood Development Plan in the works we will be able to set some legally binding rules for future developers. The NDP steering group have worked hard on behalf of the parish over the past year and have brought it to regulation 14. This means they have completed the Pre-submission consultation and advertised details of the proposals to the parish, which they did on the open day held 7th April. The event was well attended with plenty of feedback from parishioners. They are near the first formal six week consultation stage and the submission to Hereford Council. I have to pay tribute to all the member of the steering group who have put a great deal of organisational effort into the project. The dog poo bins have been a long running epic in our parish but we are finally getting there. In 2017 Hereford Council’s contractors, Balfour Beatty, quoted £3510 per year for fortnightly emptying of the three bins. We were furious at this ridiculous overcharge and collectively thought up a strategy to get a more reasonable charge. 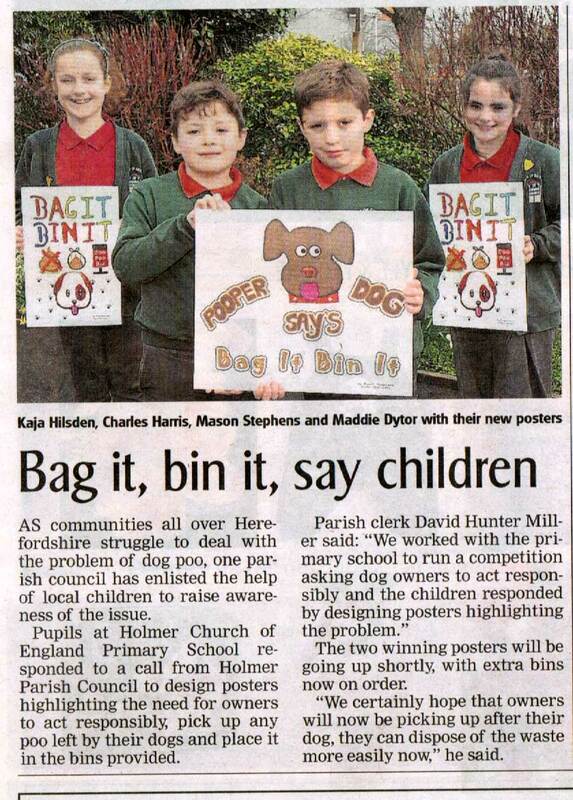 We contacted Holmer Academy School and ask them run a poster competition with the theme “dog poo – bag it and bin it” The kids relished the challenge and over a hundred works of art were produced – with two winners receiving a prize. We then contacted the Hereford Times and ask them to write an article about the school and our dog poo problem. Their journalist Jessica Phillips contacted the County Council to query the £3510 per year quote and before the article was published, in April 2018 (see below), there was a miraculous U turn by the County Council they reduced their fee from the monstrous £3510 per year to £183.83p. Our strategy paid off and we saved the parish £3326.17p. Over the past year we have improved efficiency in the way the parish council operates; we’ve not been willing to accept over expensive quotes and found ways to reduce charges, an example being the Hereford council’s first quote for the dog bins. Therefore, we’ve kept our spending low and with methods such as these together with an increase in our population we’ve manage to keep the Precept low. Because of this we are now the most cost effective parish council in Herefordshire with the smallest charge on council tax bills than any other parish council. The other area where the parish council have played a part is keeping our local pub running as a pub. In recent years its existence has been under threat because of the new land owner’s plans to develop the site. The Parish Council were unanimous in agreeing that the pub be made a community asset and with the help of Mark Haslam from CAMRA (Campaign for Real Ale) we did this on the grounds that generations of parishioners and visitors from all over the country have used the pub for over 75 years, primarily because of its large outside eating and play area. The parish now has over 365 new homes within a five minute walk of the only public house in the parish and we will have another 500 houses built in the next 10 years. The Rose Garden now re-branded as the Secret Garden is an important part of our parish I hope everyone supports the pub by dropping from time to time for a pint. One of the great improvements over the past few years has been the reporting of and maintenance of our footpaths and this is because of our footpaths officer Duncan Smart. He regularly publishes his reports on the parish council website with detailed photographs. He has improved all the footpath signs, found a lost bridal way and is currently researching the parish’s lost paths. The Parish council bought a power strimmer which Duncan uses to keep the paths clear for parishioners and we all owe Duncan our gratitude for his important service to our community. A very proactive report – this is a Parish you can be proud to live in. It is brilliant to hear all the positives that the parish council have been achieving. Really striving to improve and protect our parish. I walk daily in munstone and shelwick and do hope some maintainance can be done to improve some of the stiles which have seen better days. I am writing to confirm that residents of The Crescent remain very concerned about the serious risks posed by the proposal to construct a combined cycle/footpath on the north side of Roman Road as part of the Holmer West development. We are currently awaiting a meeting with HCC to discuss our concerns, which is being arranged by our Ward Councillor.